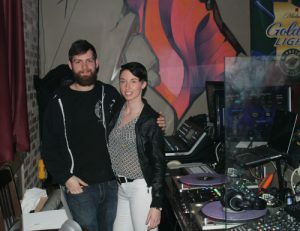 IPR College of Creative Arts recent Sound Design for Visual Media (SDVM) graduate, Brandon McCollum, collaborates with fellow IPR students, staff and alumni to create one epic event at a local nightclub called The Pourhouse. “I was talking to my buddy and IPR lab staff extraordinaire Mark Straley about his new job at The Pourhouse. It just so happened that I had already been doing shows there with my company Nice Guy Entertainment and he had gotten a full-time gig as their lead live sound engineer. Shortly after this conversation he started to be our live sound guy each time we did a gig at The Pourhouse,” said Brandon. Shortly after, Brandon booked a show at The Pourhouse for a good friend of Bottle Kids (a rap group he works with quite regularly) named Solo Davis. It was his first headlining gig and Brandon was honored to be a part of it. The event also showcased, Bottle Kids, K-Sno, Gaines FM, and Devon Reason with Travis Gorman. While planning the logistics of the event Brandon learned that unfortunately Mark Straley was unable to be the live sound guy for the event because he was booked at the downstairs venue of The Pourhouse. Therefore, he found IPR alumni, Dan Peterson, to fill in for Mark. Brandon also found out that his friend and IPR student, Rhaelle Gronholz would be the lighting tech for the event. 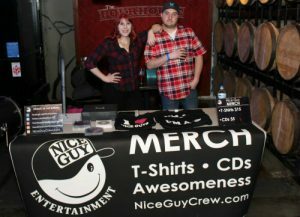 He also asked is other friends Kelsey Geiger, IPR Music and Entertainment Business (MEB) grad, to help run the Merch table. Throughout the event Cruz Theis, Music and Entertainment Business (MEB) grad, offered to snap some photos.